Caparica, Portugal, 22-25 January 2018 (Poster). A. C. Cefalas*, M. Pudovkin, A. Ferraro, V. Gavriil, E. Sarantopoulou, P. Zelenikhin, A.
III international conference on nanoparticles, nanomaterials and Applications, ISN2A 2018, Caparica, Portugal, 22-25 January, 2018 (Oral). Entropy 2018: From Physics to Information Sciences and Geometry, Barcelona, Spain, 14–16 May 2018 (Poster). Suransk, Mordovia, Russian Federation, 18-21 September 2018 (Plenary talk). XXXIII Panhellenic Conference on Solid State Physics and Materials Science, University of Cyprus, Nicosia, Cyprus, 17-19 September 2018 (Oral). AUTh Department of Chemical Engineering workshop :Research in the Department of Chemical Engineering and the role of Chemistry Engineering in Modern Greek Industry, Thessaloniki, Greece, 17 December 2018 (Poster). XXII International Symposium on High Power Laser Systems and Applications, Frascati, Italy, 9-12 October 2019 (Invited). Ferraro, M. Pudovkin, V. Gavriil, E. Sarantopoulou, P. Zelenikhin, A. Nizamutdinov, V. Semashko, and A.C. Cefalas. “Biomemetics: The holy grail of life sciences”, A. C. Cefalas, 1st Hellenic-Chinese congress on health, Athens Meeting, Athens, Greece; May 11-14 2017. “Polymeric surfaces imitate polar –entropic completion in living cells”, V. Gavriil, 1st Hellenic-Chinese congress on health, Athens Meeting, Athens, Greece; May 11-14 2017. “Current stability in amorphous semiconductors correlates with translational symmetries along conductive paths at the nanoscale”, A. C. Cefalas, 16th International scientific school, materials of nano-micro electronics and Fiber Optics: Physical Properties and Applications, Saransk, Mordovia, Russian Federation, Sept. 19-22 2017 (Invited Guest Lecture). “Nanosciences and complexity decipher biological sciences”, A.C. Cefalas, 2nd summer school on Physics and Astronomy, Argostoli, Greece, June 25-30 2017 (invited). International Conference on Coherent and Nonlinear Optics (ICONO 2016) & International Conference on Lasers, Applications, and Technologies (LAT 2016), Minsk, Belarus; September 26-30, 2016. 19th International Conference on Dynamical Processes in Excited States of Solids (DPC’16), Paris, France; July 17-22, 2016. OASIS 5 Conference, Tel Aviv, Israel; March 3–4, 2015. Athens, Greece; October 9-10, 2015. Optical Point spread function as a method for testing dynamic operation of CCDs. XXXI Panhellenic Conference on Solid State Physics and Material Science, Thessaloniki, Greece, 20 -23 September 2015. Integrins for targeting cell lines in vivo. EUROPT(R)ODE XII Conference on Optical Chemical Sensors & Biosensors, Athens, Greece, 13-16 April 2014. Nanothermodynamic sensors: Novel devices to probe polar-entropic competition and energy flow at the nanoscale. GeNeDis 2014 Conference, Corfu, Greece, 10-13 April 2014. 29th Panhellenic Conference on Solid-State Physics and Materials Science (PCSSP), Athens, Greece, 22-25 September, 2013. 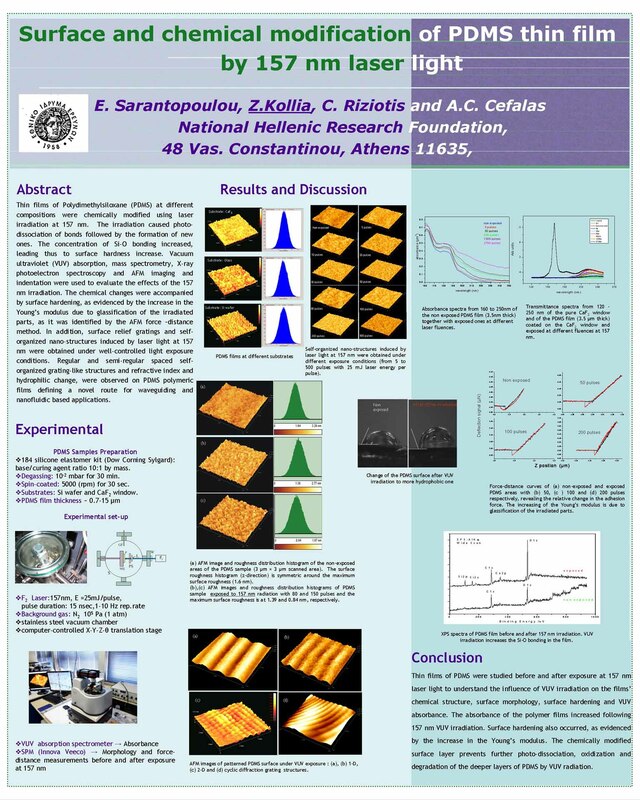 10th International Conference on Nanosciences & Nanotechnologies (NN13), Thessaloniki, Greece, 9-12 July, 2013. Rectifying Schottky Nanocontacts on Gold Nitride and Indium Nitride Nanodomains. Zurich, Switzerland, 29 luly-3 August, 2012. The Role of Extended Defects in Charge Accumulation at the Boundaries of AuN and InN Nanodomains. Thessaloniki, Greece, 24-29 June, 2012. Charge memory effects in transition metal nitride nanodomains. 27 June -1 July, 2011. Czech Republic, 3-8 July 2011. Slonano 2010, Ljubljana, Slovenia, 20-22 October, 2010. Long term oxidization and phase transition of InN epitaxial nanotextures. The formation of hollow nanospheres in Sm-Fe(Ta)-N system. Paris, France, 9-11 June, 2010. Advanced TEM characterization methods of magnetic nanostructures. REPM'10, Bled, Slovenia, 29 August - 2 September, 2010. Epitaxial InN/In2O3 -Ta and InN-Si semiconducting nanotextures. Thessaloniki, Greece, July 13-15, 2009. Surface and chemical modification of PDMS thin films by 157 nm laser light. 157 nm laser light illumination. 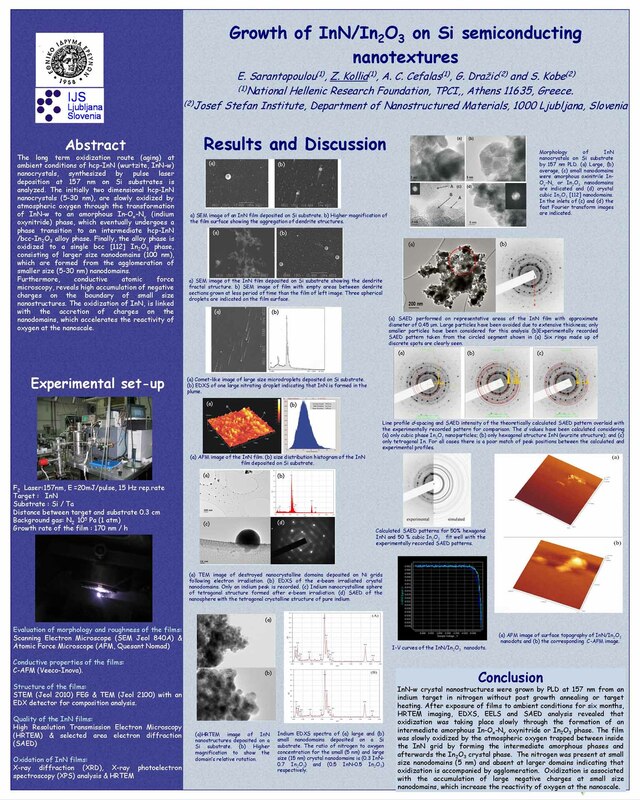 Emerging Trends & Novel Materials in Photonics, Delphi, Greece, October 7-9, 2009.
pulsed-laser deposition at 157 nm in N2. Trends in NanoTechnology (TNT2009), Barcelona, Spain, September 7-11, 2009 . Trends in NanoTechnology (TNT2009), Barcelona, Spain, September 7-11, 2009. 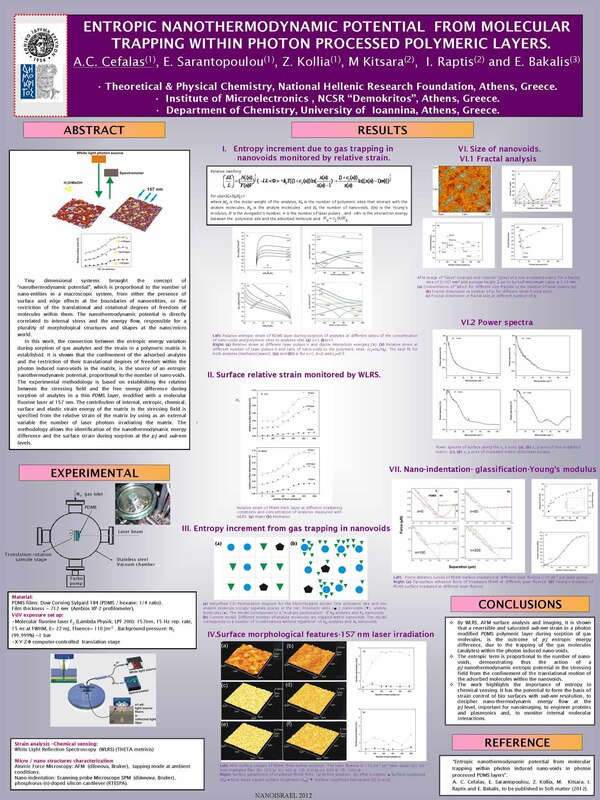 5th International Conference on Nanosciences and Nanotechnologies (NN08). Women In Nano" Winter School. Kranjska Gora, Slovenia. 7-9 Februariou (2008). Hot Nanotopics, Portoroz Slovenia, 23-30 May (2008). Preparing ulocladium cultures for studies in microgravity conditions. ELGRA-AIMAS Symposium,Plant Biology 2 session, Florence, Italy, 4-7 september (2007). 14th Internasional Conference on solid state sensors, Lyon France, June 10-14 (2007). Principles and methodologies of polymer nano/micro- fabrication with VUV ligth. E. Sarantopoulou, Z. Kollia, M. Chatzichristidi, A. Douvas, P.Argitis, S. Kobe and A.C. Cefalas. 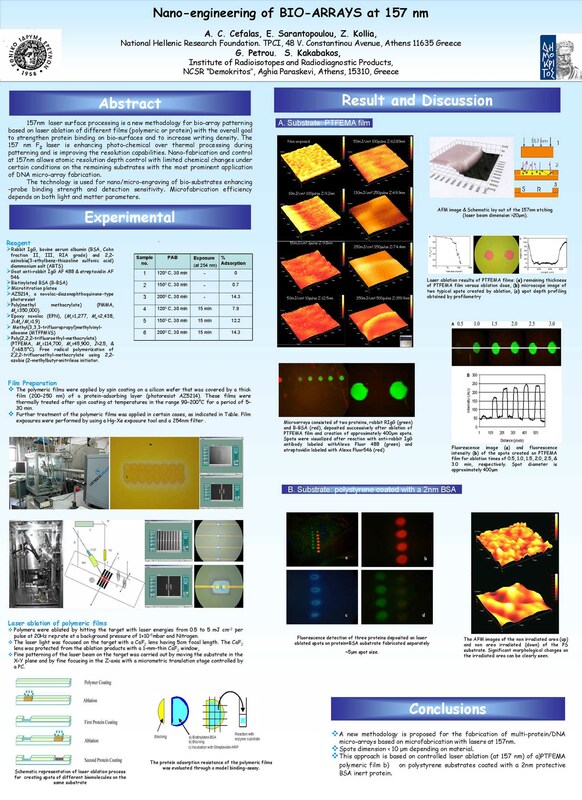 8th International Symposium on Laser Precision Microfabrication (2007). VUV Laser Fabrication of Fe-Sm-Ta-N Magnetic Nanodroplets. Enhancement of sensing properties of thin poly(methyl methacrylate) films by VUV modification. hybrid materials induced by VUV light. E. Sarantopoulou, K. Gatsouli, Z. Kollia, S. Pispas, S. Kobe and A. C. Cefalas. Fabrication of crystalline/amorphous bi-phase Sm-Fe-Ta-N magnetic nanodroplets. Self -assembled magnetic structures of Fe polymers. oxygen contamination elements in LiF crystals. VUV laser cleaning of fungus and Lichens from Hellenic archeological stones. G. Drazic, S. Kobe, A. C. Cefalas, E. Sarantopoulou and Z. Kollia. SLONANO 2006 Symposium, Ljubljana Slovenia, 20-21 September (2006). CaF2:Tm3+ nanocomposites fabricated by pulsed laser deposition at 157 nm. 5th International Conference on Inorganic Materials, Ljubljana Slovenia, 23-26 September (2006). films for bio array applications. TNT 2006 Grenoble France, 4-8 September (2006). Nanocrystalization of calcium carbonate in magnetic field. ulocladium and aspergillus 1-4 spores in vivo. Magnetic properties and structure of Sm-Fe-N nano- droplet. hybrid materials induced by VUV. doped with trivalent rare earth ions fabricated by pulsed laser deposition at 157 nm. EMRS 2006, Nice France, 29 May-2 June (2006). Polymer self-assembly with lasers at 157 nm. Nano-scale spatial control over surface morphology of biocompatible fluoropolymers at 157nm. Magnetic properties and structure of Sm-Fe-N nano droplets. A. C. Cefalas, S. Kobe, E. Sarantopoulou and Z. Kollia. Porto-Ross Slovenia, 10-12 Oct. (2005). Stuttgart, Germany. FGF-Workshopon. "Subtle Thermal Effects of RF-fields in vitro and in vivo"
Magnetic properties and structures of Sm-Fe films processed by pulse laser deposition. Technologies. 30 May -3 June, Opatija, Croatia (2005). Magnetic properties and structure of Sm-Fe-X films processed by pulsed laser deposition. EMRS 2005, 31st May-3rd June, Strasbourg France (2005). Preparation of ultra-thin films of DNA bases with laser light at 157 mm. Preventing biological activity of Ulocladium sp spores in artifacts using 157-nm laser. E. Sarantopoulou, Z. Kollia and A. C. Cefalas. 1st European workshop on Resist Limitations. Erlangen Germany,13-16 December (2004). New trends in magnetic thin film deposition by pulse laser deposition at 157 nm. E. Sarantopoulou, S. Kobe, K. Zuzek, Z. Kollia and A. C. Cefalas. Electronic Technologies. Opatija, Croatia, May 24-28, (2004). EMRS 2004, Strasbourg France. May 24-28 (2004). Current trends in 157 nm dry lithography. Strasbourg France, May 24-28 (2004). Bonding of Silicon based Nanocomposites on the surface of optical crystals. Quantum Theory of Nanocrystallization of ionic crystals in the presence of magnetic fields. Self assemply of fluor and other polymers with laser light at 157 nm. Strasbourg France, May 24-28 (2004) . Assesment of structural damage of DNA bases at 157 nm and 2.5 mm. Quantum field theory of Nano-crystallization of ionic crystals in the presence of magnetic fields. EMRS 2004, Strasbourg France, May 24-28 (2004). Self-assempled structures induced with laser light at 157 nm. Lecce Italy, 5-14 September (2004). International Magnetic Conference (INTERMAG 2003) Boston MA, USA, 3 March-30 April (2003). 11 th conference on Materials and Technology. Portoroz Slovenija, 1-3 Oct. (2003). Nanostructures and applications assisted by short wavelength light at 157 nm. Portoroz Slovenija, 1- 3 Oct. (2003). A practical and Theoretical study of the formation of CaCO3 in the presence of magnetic fields. International Magnetic Conference (INTERMAG 2003), Boston MA, USA, 3 March-30 April (2003). Analytical electron microscopy of optical materials for 157 nm. Society, 2003, p. 290. [COBISS.SI-ID 17814567], 18 - 22 May (2003). Control over nanocrystalization symmetry in turbulent flow in the presence of magnetic fields. EMRS-2003 Strasbourg France June 10-13, (2003). Nanometric size control and treatment of historic paper manuscript and pronts with laser ligth at 157nm. EMRS-2003 Strasbourg France, June 10-13, (2003). G. Drazic, S. Kobe, E. Sarantopoulou, Z. Kollia and A. C. Cefalas. The challenge of 157nm nano- lithography. Spin Electron and Magnetic properties of the 4fn-1 5d electronic configuration of trivalent rare earth ions. EMRS-2003, Strasbourg France, June 10-13, (2003). of the Er3+ ions in SrF2 wide band gap crystals. 157nm laser cleaning of lithographic optical materials. Madrid Spain, Workshop on New trends in Laser Cleaning. NETOLAC, 13-15 June (2002). Laser treatment of foxing at 157nm. EMRS 2002, Strasbourg France, 18-21 June (2002). of trivalent rare earth ions in wide band gap grystals. Non destructive determination of rare earth ion concentration in laser crystals using the VSM method. X-ray micro analysis of optical materials fir 157 nm photolithography. 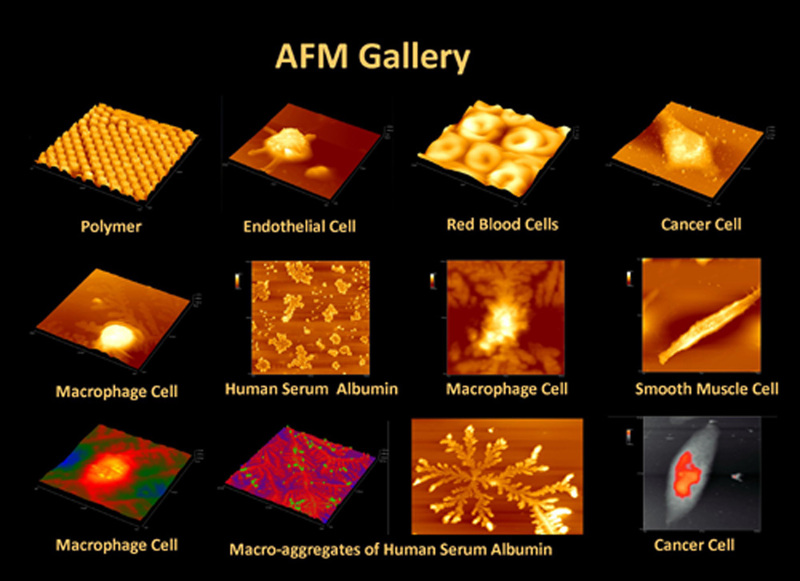 Nano strucrure imaging of biological speciments in vivo with laser plasma soft x-ray contact microscopy. AC Acharonov - Bohm Phenomena in mesoscopic rings. MNE 2002 Conference, 15-22 June (2002). Magnetic moment of trivalent rare earth ions in ionic laser crystals. 17th International Workshop on Rare Earth Magnets and their application. Newark Delaware USA, August 18-22, (2002). New Silsequioxane and Siloxane Based Resist Copolymers for 157 nm Lithography. Antwerp, Belgium, 3-6 September (2002). The resist challenge for 157nm lithography. Vacuum ultraviolet emission from wide band gap dielectric crystals doped with trivalent rare earth ions. Photodissociation dynamics of DNA bases. Capri Italy, 29 September-3 October, (2002). Evaluation of siloxane and polyhedral oligomeric silsesquixane copolymers for 157 nm lithography. Annaheim, CA, USA, May 28-31, (2002). Kazan Russia, 24-28 Sept. (2001). Lasers in Metrology and Art Conservation.Removing foxing stains from old paper at 157nm. Munich Germany, 18-22 June (2001). dielectric crystals. Dynamical processes in Excited electronic states of Solids. Lyon France, 1-4 July (2001). Restoration of Historic paper using Vacuum Ultraviolet Lasers. Lasers 2001, Tucson Arizona USA, 4-8 December (2001). The challenge of 157nm Photolithography. Lasers 2001, , Tucson Arizona USA, 4-8 December (2001). International Conference on Lasers 2001, Tucson, Arizona, USA, 3-7 Dec. (2001). Ultrafine resolution analysis assisted by chemically amplified resists. Antwerpen, Belgium 24-25 January (2000). 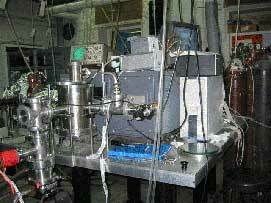 Laser Induced Breakdown Spectroscopy, LIBS 2000 Tirenia, Pisa Italy, October 8-12, (2000). Intense Vacuum Ultraviolet Emission at 172 nm from LaF:Nd crystals. Micro and nano-Engineering 2000 Jena Germany, September 18th-21st (2000). Photoresist materials for 157nm photolithography. EMRS 2000, Strasbourg France, May 30-June 2, (2000). Vortex interference in Josepson array in the insulating phase. in wide band gap fluoride crystals. Lasers 2000, , Albuquerque, New Mexico, December 4-8, (2000). Albuquerque, New Mexico, USA, 4-8 Dec. (2000). Oxford UK, 24-25 June (2000). Optical materials for 157 nm photolithography. Santa Clara California USA, Sept. 26-1, (1999). Absorbance and outgasing of photoresist polymeric materials for 157nm photolithography. San Diego California, USA, 14-16 November (1999). Optical materials for 157nm photolithography. A. C. Cefalas, E. Sarantopoulou P. Argitis, T. W. Ford, A. D. Stead, C. N. Danson and D. Neely. Abington, UK, 20-21 December (1999). CLEO Europe 98, Glasgow, Scotland 13-18 Sept.1998, CLEO, CMD6, (1998). Crystal field splitting of the 4f25d levels of the Nd3+ ions in LiCaAlF6 crystals. EQEC 98, Glasgow, Scotland 13-18 Sept.1998, EQEC, QWC59, (1998). Users meeting of Rutherford Appleton Laboratory, Didcot, Abington, UK, May 24-26, (1998). International Conference on Lasers 98, Tucson, Arizona, USA, 7-11 Dec. (1998). On the 4f25d-4f3 interconfigurational transitions of the Nd3+ ions in PFYK crystal host. Island of Kos, Greece, October 10-16, (1996). On the 4f75d-4f8 transitions of the Tb3+ ion in LiLuF4 single crystal hosts. CLEO\QELS 96 Anaheim California USA, June 2-7, (1996). in Laser Dissociation of HgBr2. 5th European Conference on Atomic and Molecular Physics, Edinburgh, United Kingdom, April 3 -7, (1995). ECAMP 5, Edinbourg, UK (1995). VUV and UV luminescence of rare earth activated ions in LiYF4 and LiLuF4 single crystals. Albuquerque, New Mexico, USA September 20-25,(1992). at 157 nm from an F2 molecular laser. 10th International conference of vacuum ultraviolet physics, Paris France (1992). New developments on VUV and UV solid state laser sources pumped by an F2 molecular laser at 157 nm. 9th International Symposium on Gas Flow and Chemical Lasers, Heraklion Greece (1992). Efficient tunable VUV LaF3: Nd3+ laser. IQEC 1992, 18th International Quantum Electronic Conference Vienna (1992). Efficient VUV LaF3 :Nd3+ based VUV solid state laser pumped by pulsed discharge molecular F2 laser. 9th International interdisciplinary Laser Science conference, Monterey, California (1991). Observation of quantum beats in deexcitation of mercury triatomic clusters. 23 rd EGAS Torun, Poland (1991). Mass Spectrometric observation of the triply ionized mercury dimer Hg3+ formed by electron impact. Vilnious Lituania, 15-25th August (1990). 22nd EGAS Upsala, Sweden (1990). Free induction decay in alkali vapour. Ancient Olympia, Greece, June 19-23, (1988). Vilnious Lituania, August 22-29, (1987). in molecular beams-spectroscopy of mercury trimers. Vilnious Lithuania, August 22-29, (1987). Phase conjugation in an excimer system. Amplification and gain measurements at 157 nm in a molecular fluorine pulsed discharge molecular laser. International Conference of VUV Radiation Physics, Lund Sweden, (1986). An Optically pumped supersonic HgBr(B-X) molecular beam laser. Phase conjugation by degenerate four wave mixing at 193 nm in an ArF amplifier. 6th national Quantum Electronics Conference, Brighton, UK (1983). Electronics, and Electronic Technologies, Opatija, Croatia, May 24-28, (2004). I. Raptis, D. Niakoula, E. Tegou, P. Argitis and E. Gogolides. Analytical electron microscopy of Tm clusters in optical grade CaF2. workshop on Embedded systems, Oct. 1-3, 2003. Ptuj Slovenia. Ljubljana:MIDEM-Society for Microelectronics, Electronic Components and Materials, pp393-398. materials for 157 nm photolithography. S. Kobe, P. J. Mc Guiness. XI Feofilov Symposium on Spectroscopy of Crystals Activated by Rare-Earth and Transition Metal Ions. S. Kobe, B. Podmiljsak, P.J. McGuiness, G. Drazic, E. Sarantopoulou, Z. Kollia, A. C. Cefalas. Proceedings of the 17th International Workshop on Rare Earth Magnets and their application. Edited by G. C. Hadjipanayis and M. J. Bonder, Page 228-235, Newark Delaware USA, August 18-22, (2002). conference on "Lasers 2001", 3-7 December 2001, Tucson Arizona, USA. pp-252-257, (2002). E. Sarantopoulou, Z. Kollia, A. C. Cefalas. Proceedings of the international conference on "Lasers 2001", 3-7 December 2001, Tucson Arizona, USA. Proceedings of Laser Techniques and Systems in art Preservation, COLA Munich 18-22 June 2001. Proceedings edited by R. Salibeni. SPIE V4402, p139-144, (2001). 20-22 November 2000, Athens, Greece, A. D. Nassiopoulou, X. Zianni, eds, pp 127-130, World Scientific (2001). Optics within Life Sciences, OWLS V, 277-280 (2000). "VIII International Readings on Quantum Optics (IRQO'99) Kazan, Russia, Oct. 1999. Proceedings edited by V. Semarchev SPIE-Int. Soc. Opt. Eng. V4061, p 306-316, (2000). edited by P. A. Atanasov and D. V. Stoyanov, SPIE-Int. Soc. Opt. Eng. Vol. 3571, 328-332, (1999). 21-25 Sept. 1998, proceedings edited by P. A. Atanasov and D. V. Stoyanov, SPIE-Int. Soc. Opt. Eng. Vol. 3571, 388-391, (1999). 21-25 Sept. 1998, proceedings edited by P. A. Atanasov and D. V. Stoyanov, SPIE-Int. Soc. Opt. Eng. Vol. 3571,185-189, (1999). by V. J. Corcoran and T. A. Goldman, STS press, Mc Lean , page 649- 652 (1999), (INVITED). Interface '99 Proceedings, 14-16 November 1999, San Diego, California, USA, pp 197-205, (1999), (INVITED). Annual report of Rutherford Appleton Laboratory Technical Report, RAL-TR-98-007, (1998). 2nd International Conference on New Laser Technologies and Applications, 1-4 June 1997, Olympia-Greece, proceedings edited by A. Carabelas, P. Di Lazzaro, A. Torre, G. Baldacchini, SPIE-Int. Soc. Opt. Eng. 2nd International Conference on New Laser Technologies and Applications, 1-4 June 1997, Olympia-Greece, proceedings edited by A. Carabelas, P. Di Lazzaro, A. Torre, G. Baldachini, SPIE-Int. Soc. Opt. Eng. Vol. 3423, 411-415, (1998). Proceedings edited by V. V. Samartsev, SPIE-Int. Soc. Opt. Eng. Vol. 3239, 240-244, (1998). Science- High Power Laser Programme, CLF Annual report RAL - TR - 97 - 045, 12-13, (1997). 9th International School on Quantum Electronics: Lasers-Physics and Applications, 16-20 Sept. 1996, Varna-Bulgaria, Proceedings edited by P. A. Atanasov SPIE-Int. Soc. Opt. Eng. Vol. 3052 , 235-240, (1996). proceedings edited by D. Schuocker, SPIE-Int. Soc. Opt. Eng. Vol. 1031, 500-505, (1988). Gas Flow and Chemical Lasers, Jerousalem-Israel 1986, Springer Verlag, Proc. Appl. Phys. Vol. 15, 132, (1987).